Talk to you in 2011!! Have a wonderful New Years Eve and New Years Day!! We sure did. Baby Jake is now walking and talking, so cute!!! I guess 15 months is not quite a baby anymore. He is trying to say and repeat words now. He had such a fun Christmas, and we enjoyed playing with him and all of his fun new toys. 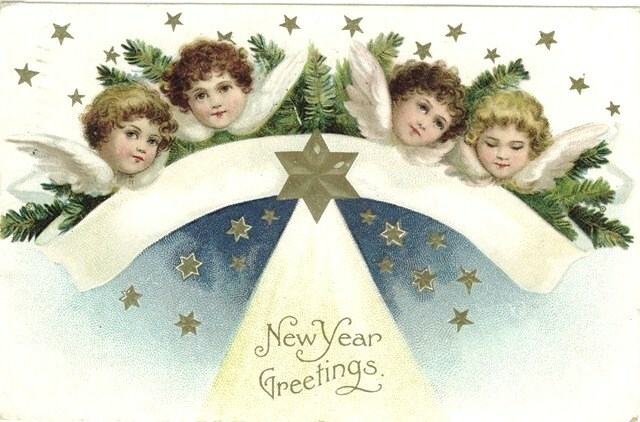 I want to wish all of you a very Happy New Year!!! Feel free to use this graphic if you want to. Just click on it and save. I am a bit under the weather today, as I think the holidays finally caught up to me. I have laryngitis and a sore throat. Hope it goes away before New Years Eve. I will be starting on the Valentines projects soon, if you can believe that. Have a great week, and a very Happy New Year!! These are just some scenes around my house. I can't believe that Christmas is here once again. Where does the time go? 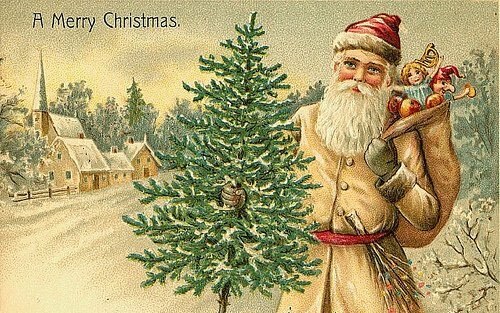 I hope you all have the best, most wonderful holiday, and Santa brings whatever you wish for. Hope you are all ready for the big day. They take time, but are worth the effort. It's been raining here since Friday, and we are suppose to get more. I'm pretty sure I might need an Ark for Christmas. I have been working on some paper decorations. All you need are some old book pages, glue, scissors, glitter, seam binding, and some time. The last one is the hardest, as I haven't had much time lately. I'm finally getting done with my shopping, now everything has to be wrapped. I'm finding that stocking stuffers are the most difficult this year. I like to try to find interesting and unique items. I have to fill 5 stockings. Somehow my daughter has 2 stockings. She has since she was a baby, so the tradition continues. She loves it!! Who wouldn't? It's all fun just the same. I need to make a call to Santa, maybe he can help me out. I have been the worst blogger lately, but I'm sure you are all very busy this time of year. We had a tiny heatwave, and thank goodness it's now over. It's back to the regularly scheduled weather for Christmas. Did a very scientific pull of the winner early this morning. Put the names in a hat and shut my eyes. The winner is Pattie, of Hollyhock Farms Blog. Pattie, I will send your email to the sign guy and he will get in touch with you so you can pick out your sign. 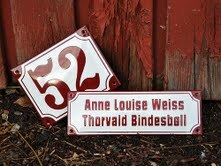 I was approached to do a giveaway with some really pretty enamel signs. All you have to do is check out the site and leave a comment here on my blog. Then when a winner is chosen you contact them for your sign. Just leave a comment and I will draw a name on Monday. Let me know how you like the signs. I told the nice guy from Denmark that I would pass this on to you, so please take advantage. We got our tree yesterday, and I love it! I think it's my favorite of all time. We barely looked at any trees, and as soon as I saw this one, I knew it was for me. We buy our tree from the high school baseball team lot. The money goes to the high school team. The boys deliver it to your house which means no needles in or on your car. I spent the afternoon decorating it, and the house. Here are a few glimpses for you. My colors are neutrals and silvers for my living and dining rooms. Reds in my kitchen and family room. Which I will leave for another post. Hope you are having a great weekend!! I'm still making crowns and other various items for the shops, so it will be another busy week ahead. Have a great week, and chat again soon. Just wanted to show you what I have been working on lately. This burlap tree, although took many hours of work, I think the look was worth it. I have been making a lot of Christmas items for the shops, but to be honest I forgot to take photos before they left my house. I normally always photograph my stuff, but for some crazy reason (like they had to be done yesterday) I forgot. So before this tree goes bye bye here it is. I hope you are all having a great week!! Have a nice weekend! !